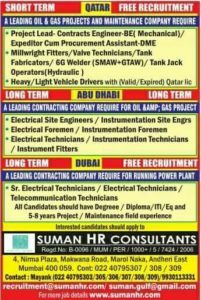 CHECK FREE RECRUITMENT JOBS IN GULF – URGENT REQUIREMENTS FOR A MINING COMPANY IN SAUDI ARABIA. Vacancies are in Large Numbers. Free recruitment. 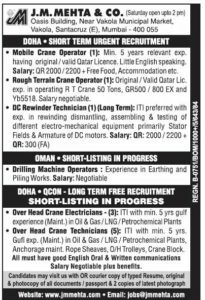 HUGE FREE RECRUITMENT JOBS IN GULF – Foreman I – Electrical workshop – 17/GG04312, Rock Mechanic Engineer- Office of the Mine Manager – 17/GG04313. , Storekeeper II – Warehouse – 17/GG04314, Rock Mechanic Engineer – 17/GG04316, Miner III – 17/GG04317, Shift Boss II, Mill -17/GG04320, Foreman I, Electrical – 17/GG04323, Mechanic I, HE -17/GG04325, Planner II Maintenance -17/GG04327, Foreman Electrical – 17/GG04328, Electrician II, HE – 17/GG04329, Storekeeper I – 17/GG04330, Operator II, Mill – 17/GG04332, SCADA Operator – 17/GG04333, Chief Planning Engineer – 17/GG04334, Senior Mining Engineer – 17/GG04335, Surveyor – 17/GG04336, Wet Assayer – 17/GG04339, Senior Metallurgist – 17/GG04340. FREE RECRUITMENT JOBS IN GULF – For detailed JD and to apply Online Visit: Email your resume in MS – word Format to [email protected] Compulsorily mentioning position & Job Code in the Subject line. G.GHEEWALA HUMAN RESOURCES CONSULTANTS H.O. : 202-A, Bombay Market, Tardeo, Mumbai – 400034. 9223377358. Tel: 022 – 66665353/395. Web : www.ggheewala.com. These Consultancy have no Sub Agents. For more Latest Gulf Job recruitment visit this Site and check the Job recruitment details that have been recently posted. FREE RECRUITMENT IN GULF: J.M. MEHTA & Co. (Saturday open up to 2 pm) Oasis Building, Near Vakola Municipal Market, Vakola, Santacruz (E), Mumbai 400 055. DOHA SHORT TERM URGENT RECRUITMENT. Mobile Crane operator (1: Min. 5 years relevant exp having original/valid Qatar Licence. Little English speaking. Salary: QR 2000/2200 Free Food, Accommodation etc. Rough Terrain crane operator (1:0riginal/Valid Qatar Lic exp. in operating RT Crane 50 Tons, GR500 /800 EX and Yb5518 Salary negotiable. DC Rewinder Technician: exp. in rewinding dismantling, assembling & testing of different electro-mechanical equipment primarily Stator Fields & Armature of DC motors. Salary: QR: 2000/2200 QR: 300 (FA). Drilling Machine Operator Experience in Earthing and Piling Works. Salary: Negotiable. 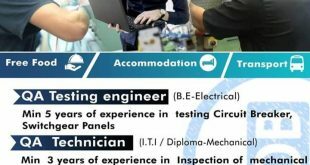 Over Head Crane Electricians (3) ITI with min, 5 yrs gulf experience (Maint.) in 0il & over Head Crane Technicians (5) ITI with min. 5 yrs Gulf exp. (Maint) in Oil & Gas/LNG/Petrochemical Plants Anchorage MAINTAINCE Rope Sheaves, 0/H Trolleys, Crane Block. All must have good English Oral & Written communications Salary Negotiable plus benefits. Candidates may visit us with OR courier copy of typed Resume, original & photocopy of all documents / passport &2 copies of latest photograph. Current – doing training in Tata motors service centre in commercial vehicles. Siddiqui Naseer Ahmed sir.i need a job for hr manager ihave12 years of gulf experience for this position.in aviation co.please call me 7036770817.ineed free recruitment job in Dubai Qatar Canada and Saudi. I am a senior document controller in EIL for IOCL BS-VI project. Looking forward to work in gulf countries. Please let me know if there will be any vacancies over there.